Born in a small village near Kunnamkulam, Kerala, India in 1946, His Holiness Moran Mar Baselios Marthoma Paulos II was raised in a very devoted and spiritual family who significantly influenced his life. He attended pre-university and undergraduate studies at St. Thomas college and continued his postgraduate studies in sociology at CMS College, Kottayam. At Parumala Seminary, H.H. was ordained as sub-deacon in 1972, and later, as a full deacon at Sion Seminary, Koratty in 1973. In 1973, H.H. was ordained as priest; then known as Rev. Fr. K.I. Paul, and celebrated his first Holy Qurbana at Mar Gregorius Orthodox Chapel Mangad. Fr. Paul served as priest to St. Mary's Orthodox Church Ernakulam, Moolepat Orthodox Church Pazhanji, St. Marys Magdalene Convent Adappotty, Kummanmkulam, and Medical College Chapel Kottayam. After being elevated to Ramban in 1983 at Parumala Seminary, H.H. was later consecrated as Episcopa with the name Paulose Mar Milithios in 1985 and served Kunnamkulam Diocese. H.H. was elevated as Metropolitan in 1991 and on September 27, 2006, His Holiness was nominated as the current successor to the Catholicos of the East and Malankara Metropolitan. The Episcopal Synod with the Catholicos as its presiding leader is the governing body of all bishops in the Malankara Orthodox Syrian Church. The authority of the Holy Synod is considered final and binding in its decisions that uphold the faith of the church, its discipline and order of Apostolic Succession. The bishops serve the assigned diocese that is entrusted to them by the Holy Synod. As regards temporal matters, the church is advised by the Malankara Syrian Christian Association which is a governing consortium of lay members of the Church. His Grace was born as the son of E.K. Kuriakose and Sosama Kuriakose. His Grace is a member of St. George Valiyapally, Chungathara , Malabar Diocese. After taking his Bachelors Degree in Science from Malabar Christian College, Calicut, he joined the Orthodox Theological Seminary, Kottayam, for theological studies. ​From the Orthodox Theological Seminary, Kottayam, he took Graduate Degree in Sacred Theology (GST) and the Bachelor of Divinity (BD) degree at the Senate of Serampore University. His Grace also completed his M. Th (Religions) from Gurukula Research Institute, Chennai of Serampore University and D.Th ( Advaitha Vedanta) from Serampore University. His Grace held several key positions in the Holy Church : Professor at Orthodox Theological Seminary, Kottayam, Registrar of the Orthodox Theological Seminary, Kottayam, Principal Secretary to His Holiness Didymos Catholicos, Cheif Editor of the Malankara Sabha Magazine, Member of the Ecumenical Relations Committee, Seminary Governing Board Member, Bible Society (Kerala Auxilary) Member etc. His Grace was elected as the Metropolitan of the Malankara Orthodox Church on 17th February 2010 at the Malankara Association held at Sasthamkotta. 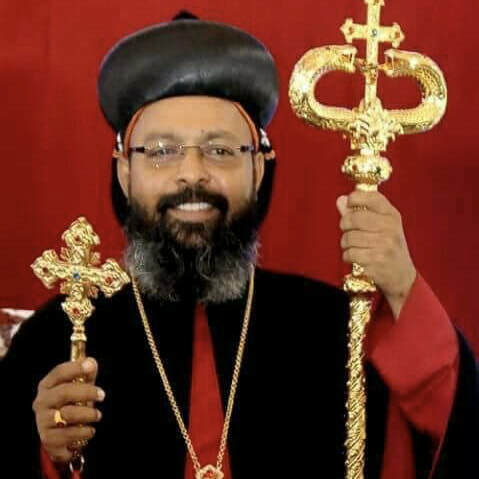 He is consecrated as Metropolitan on 12th May 2010 at Mar Elia Cathedral, Kottayam.His Grace also currently serving the Adoor - Kadampanad Diocese as its Metropolitan. In addition to the responsibilities of the dioceses, His grace also works as the visiting professor of Orthodox Theological Seminary, Kottayam, President MGOCSM, Director of Sruti School of Liturgical Music and Manager of the St. Cyril's College Adoor, Thapovan Public School & St. Marys HS & HSS, St. Thomas HSS Kadampanadu. His Grace is a good singer, writer, and is a great speaker.